Bring in the New Year with the family with an unforgettable celebration and set sail with us aboard the Sundancer Yacht! This NYC New Year’s cruise is going to take you and the family around the city and treat you to the perfect introduction to the New Year. Celebrate on this great ship and bring in 2019 with an unforgettable experience. Your New Year’s celebration aboard the Sundancer Yacht will have you enjoying views of the city, music, food, and drinks. Leave 2018 at the pier and celebrate New Year’s Eve with the perfect celebration in New York City. Check out the details on our NYC New Year’s cruise below and book your tickets aboard today! Sail on the Sundancer Yacht and enjoy our unforgettable New Year’s Eve celebration with the family. Our NYC New Year’s cruise is going to take you and the family around the city and treat you to breathtaking views. Watch as the city skyline passes you by and treat the family to amazing views of the city’s landmarks. Complimentary New Year’s party favors will also be available for you and the family to enjoy as you listen to the hits of this year. Our NYC New Year’s cruise will have a live DJ onboard playing nothing but the hits of 2018. Dance into the night as the Top 40, Pop, Dance, and Hip-Hop hits blast and enjoy a full dinner buffet with the family. Celebrate the end of the year with dinner on the seas and feast on a variety of delicious dishes. Enjoy dinner and sip on your favorite drinks with the four-hour open bar available for you! Get the drinks in your hand and raise a glass to the New Year as we help you bring in 2019 right. At midnight, our NYC New Year’s cruise will treat you and the family to an amazing view of the New Year’s fireworks! End off the year with the fireworks and celebrate the arrival of 2019 on the seas! Book your tickets aboard our NYC New Year’s cruise and make your New Year’s Eve celebration one to remember. 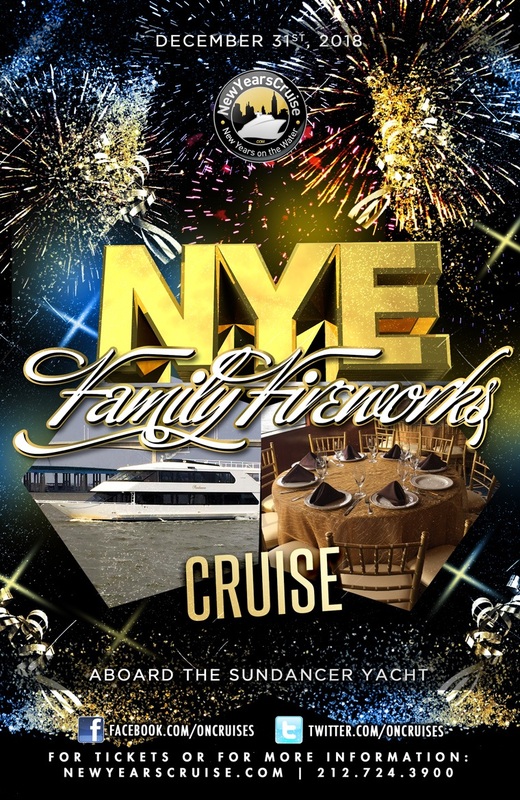 You definitely don’t want to miss out on bringing in the New Year with the family aboard the Sundancer Yacht!